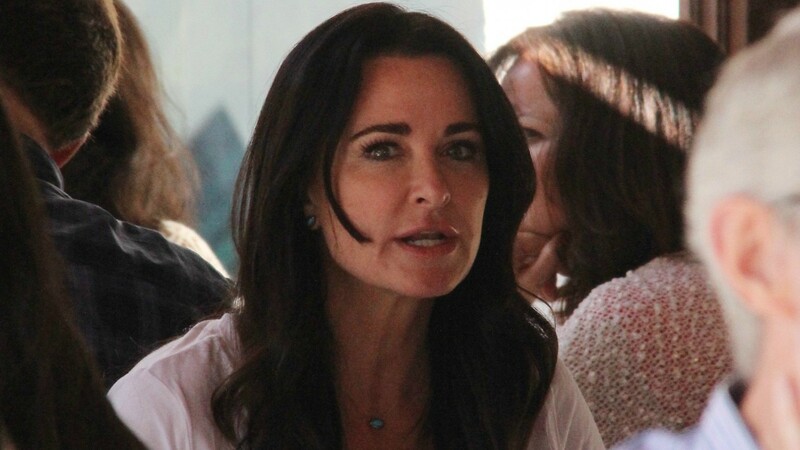 Despite their volatile past, Kyle Richards is standing up for her sister, Kim. Kyle appeared alongside Sonja Morgan on an episode of Watch What Happens Live this week, promoting their respective shows, The Real Housewives of Beverly Hills and The Real Housewives of New York. They delved into a lot of the drama viewers have seen on both shows, but one of the first things they addressed was when Brandi Glanville wore a T-shirt that read, “It’s Not Fun To Be Sober” to a picnic attended by Kyle’s sister, recovering alcoholic Kim. Kyle also explained the fight she had with Lisa Vanderpump on the latest episode of The Real Housewives of Beverly Hills, saying they’ve both put the incident behind them. “Lisa and I are great, which is why I didn’t want to ‘rock the yacht’ in Dubai,” she said. Morgan got her turn in the hot seat as well, explaining the preview clip for the upcoming season of The Real Housewives of New York that shows Ramona Singer and Bethenny Frankel accusing her of drinking too much. “I was just keeping up with the Countess [LuAnn de Lesseps],” she said, shrugging. And a caller who asked Morgan if she had dated de Lesseps’ now-fiancé, Thomas D’Agostino Jr., got the full story. What do you think was the most shocking thing Sonja Morgan and Kyle Richards revealed during their interview? Let us know down in the comments.